If your taxable estate value is greater than the available unified credit allowed by the IRS, which after January 1, 2015 will be $5.43 million for a single person or $10.86 million for a married couple, then you pay a tax on the overage of that amount. State Estate Taxes: What most people don’t know is that 15 States and the District of Columbia impose an additional State Estate Tax on people who die as residents of those States. These States include: New Jersey, Delaware, Maryland, New York, Connecticut, Rhode Island, Massachusetts, Vermont, Maine, Tennessee, Illinois, Minnesota, Hawaii, Oregon, and Washington. All of those States and the District of Columbia have an exemption or credit that works in the same way as the Federal exemption, but the amount varies by State. For our neighboring States the exemption is: $675,000 in New Jersey; $1 million in Delaware; $1 million in Maryland; and $2.06 million in New York (which will increase incrementally each year until 2019 when it will be equal to the Federal exemption). This means that if you are a resident of one of these States when you die and your total taxable estate is more than that State’s Estate Tax credit, your estate will pay tax on the overage of the credit amount to the State. In New York, if you are more than 5% over the State exemption, you pay State Estate Tax on the entire estate not just on the overage amount! Estate taxes are paid by the estate. Therefore, all Estate Taxes owed either to the Federal or to a State Government or both would be paid for by the estate prior to any distributions being made to any beneficiary. Inheritance Tax: An Inheritance Tax is a tax imposed on someone who inherits property or money from someone else. There are only six States that impose an Inheritance Tax, they are: Pennsylvania, New Jersey, Maryland, Kentucky, Iowa, and Nebraska. 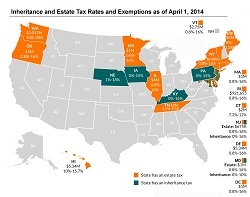 Only two States, New Jersey and Maryland impose both an Estate and an Inheritance Tax. The tax rate imposed depends on the relationship of the recipient to the decedent. Inheritance taxes are usually paid for by the estate of the decedent prior to any distributions being made to any beneficiary. In Pennsylvania, the Inheritance Tax rate ranges from 0% to the surviving spouse; to 4.5% to children, grandchildren, and parents of the decedent; to 12% to siblings of the decedent; and then 15% to everyone else. In New Jersey, the Inheritance Tax rate ranges from 0% to 16% depending on the relationship between the decedent and the beneficiary. If you live in the Northeastern part of the country, it is possible that you will have either an Estate or Inheritance tax issue and it is important to understand the differences between them. By working with an estate planning attorney you can minimize your possible tax exposure by creating a plan before you die. If these taxes were around in Ben Franklin’s time, he might have chosen to die in Boca Raton, Florida and not Philadelphia. Map Sources: U.S. Census Bureau; State Statutes; Schoening Strategies.